Vicki Turner, Julie Marsh and Tracey Clarkson. Picture by John Millard. Two schoolyard mums have found their own tribe with the launch of their boutique children’s shop. Julie Marsh and Vicki Turner, both mums to two young children, have launched dedicated kids’ clothes and gift shop Tribe in the heart of Tynemouth. The enterprising pair have secured listings with highly regarded plus new and exciting UK and European based designers, whose clothes are not available anywhere else locally. Catering mainly for new-born through to 10 and 11-year-olds, Tribe is already proving a welcome addition to the retail mix on Percy Park Road. Julie said: “The Tribe philosophy is quality, stylish, fit for purpose clothing which stands out from the crowd and let’s children enjoy themselves. 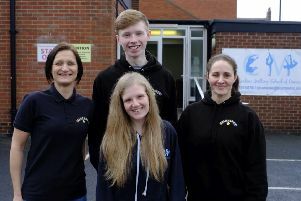 Tribe was supported through North Tyneside Council’s Business Factory programme which worked with the pair to ensure that their business plan was robust enough to withstand the harsh realities of retailing and offered encouragement and support. The Business Factory is delivered through TEDCO Business Support which offers a range of start-up and business growth advice.